Faraway planet, windswept islet—readers of late essayist, novelist, and poet Le Guin (1929–2018) are accustomed to sprawling geographies, sprawling timelines, and sprawling lives. It’s hard to be at home at the edge of creation, where death and oblivion are unmasked as fictions, and harder still to spin any sense from the kinships we sometimes impose on the unknowable. But that has been Le Guin’s game since there were flying lions and gnomes in her novels—you’ll find them if you go back far enough. Poetry is not a secret subplot in the story of her life as a writer, though the dozen or so volumes she published, beginning with 1974’s Wild Angels, are seldom written about and so remain secret-like. So Far So Good concludes Le Guin’s final trilogy (if you will), after the “Life Sciences” section of Finding My Elegy and Late In The Day, and strongly reflects and refracts a life spent dreaming of Earthsea, of action and change, of giving form to mystery, and vice versa. “I am such a long way from my ancestors now/ in my extreme old age that I feel more one of them/ than their descendent,” she writes in “Ancestry,” as if to reprise, in the entanglement of past and future, the opening lines of her 1985 novel Always Coming Home. Throughout all of Le Guin’s poetry, as in much of her fiction, animals talk and shape-shift, rain speaks, the soul and body cross terrestrial paths and then part ways, and the wind is an entropic phenomenon that will outlast modern science. 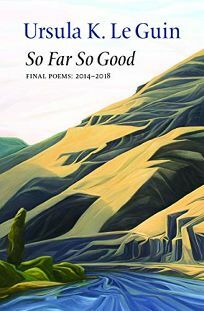 Of the poems assembled in this collection, readers may ask are they nearly as fast as, or faster than, light? They are koan-ical, comical; here a little Dorothy Parker, there a touch Richard Brautigan. And so they are ever-shadowy where objects block the sun, always “bringing the silent desert/ distances back to the heart.” Somewhere in the Oregon high desert an almost-century swept over Le Guin’s championship of American letters, of feminism and anarchism, of the novel, and, of course, cats. Her writings and convictions were driven by a big heart—the heart of a poet who knew all too well the difference between miracle and eureka, revelation and revolution. So Far So Good is here to remind us of that. For work that is so highly mannered and formal, a subject about which Le Guin wrote extensively during her life, these poems are candid in the extreme, casual in the faces of death, funny, glum, reverent, irreverent, certain, uncertain, but never trivial, never an afterthought, never the product of anything other than rigor and discipline and delight in what’s left of the world. Peter Milne Greiner is the author of Lost City Hydrothermal Field (The Operating System, 2017).